Cooking on the grill is one of the things I most love about the summer months and these Chicken and Bacon Kabobs are one of my favorite things to make. This recipe is really hard to mess up. Even if you start to enjoy a glass of wine a little too much and forget there is food on the grill. Hey, it happens. The bacon, which is wrapped around the chicken helps keep the chicken from drying out. 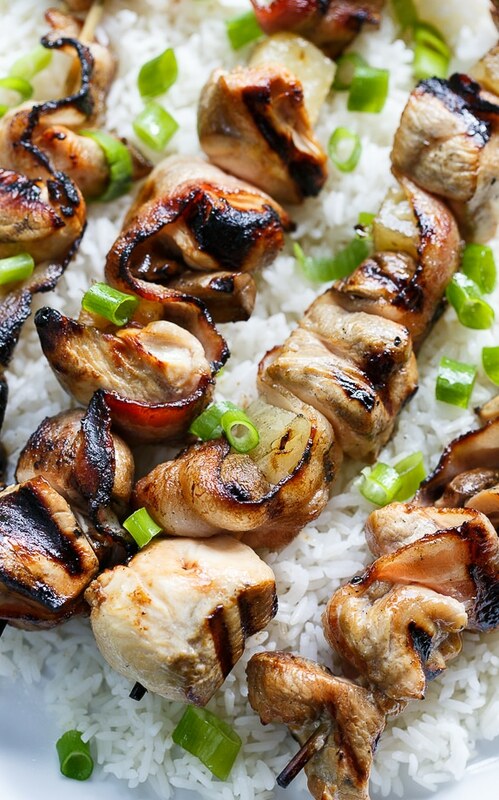 These Chicken Bacon Kabobs also have mushrooms and pineapple so if you serve them over rice you have a whole meal. That’s what I love about kabobs. The chicken and mushrooms are marinated in soy sauce, apple cider vinegar, and honey. 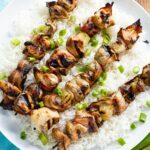 The flavors of the marinade combined with the smokiness of the bacon creates one delicious kabob. You have saltiness from the bacon and marinade and a little sweetness from the pineapple and honey. You really can’t go wrong with Chicken and Bacon Kabobs! 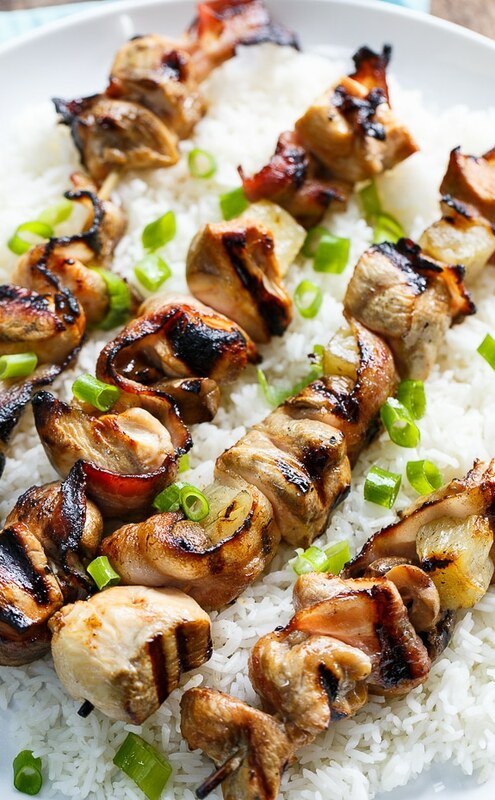 These Chicken and Bacon Kabobs just may be the tastiest kabobs ever. A simple marinade and wrapping the chicken with bacon really amp up the flavor. Mix first 5 ingredients in a large bowl. Add mushrooms and chicken and stir to coat. Preheat grill for medium-high heat or heat grill pan over medium-high heat. 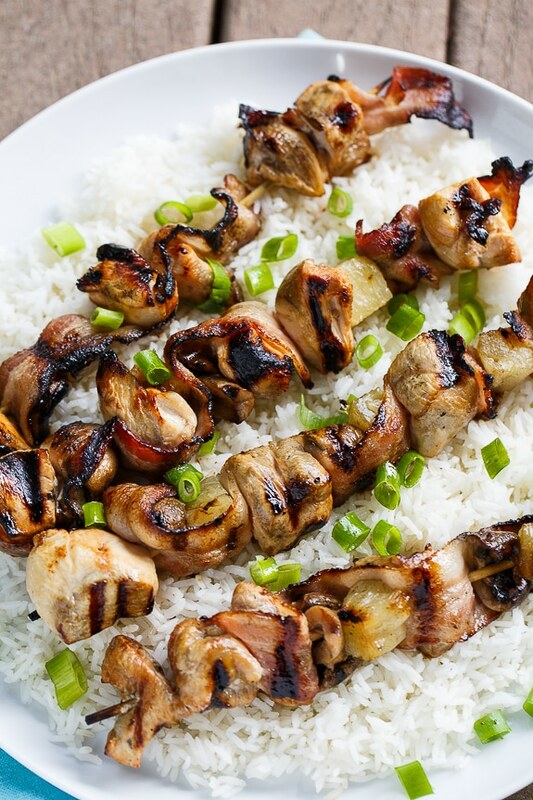 Wrap chicken chunks with bacon and thread onto skewers alternating with pineapple chunks and mushroom halves. You can either cut the bacon into smaller pieces and wrap each piece of chicken individually or leave the bacon whole and snake it back and forth so that it forms an "S" shape. For example, it would go on the left side of a piece of chicken and then on the right side of the next piece and repeat this pattern. Arrange skewers on grill and cook about 15 minutes, brushing occasionally with marinade and turning to brown all sides. If using wooden skewers, soak them at least 60 minutes in water. Fat dripping down from the bacon may cause flare-ups so watch grill closely. This entry was posted in Dinner, Main Dishes and tagged chicken, grilled, kabobs, poultry, summer. Bookmark the permalink. Absolutely love everything about these kebobs! Will add this to my next week’s menu!! Christin, glad I ran across your post today. Chicken is a favorite at our house so it’s always good to find new ways to prepare it and who doesn’t love bacon. I love grilling during the summer too- so relaxing! And I also realllly love recipes that are next to impossible to screw up AND taste delicious! So, obviously these kabobs are calling my name! Plus there is bacon- Always a winner! These are up next for my grill! Thanks for sharing the yum, girlfriend! Cheers! I can’t believe I’ve never thought to wrap my chicken kabobs with bacon! Um, totally genius! 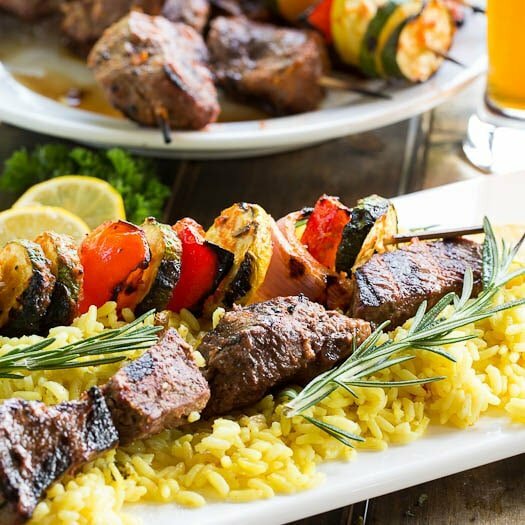 These kabobs look absolutely incredible, Christin! The only thing better than grilled chicken kabobs are ones that are bacon wrapped! These look incredibly good! Christin, your marinade sounds delicious!!! I love kabobs!!! Can’t wait to meet you on Thursday! See you in Nashville! Kabobs in the summer are my favorite! These chicken and bacon ones sound amazing, Christin! The marinade sounds like the perfect touch!